Total Chaos Fabrication in Corona California offers one of the Industry's best upper control arms. 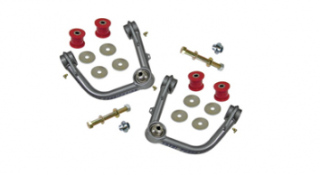 The control arms are made of 4130 Chromoly Steel that convert the factory ball joint to a 1'' uniball for added component strength and maximum wheel travel. These upper control arms are 100% bolt-on and are manufactured in USA. They are designed with an added caster to aid in retaining factory alignment specs when aftermarket lift kits are installed. This reduces the darting or wandering in the vehicle's steering when 2.5"-3" lift kits are installed. The two Stage powder coating provides a long lasting finish and includes a complete grade 8 hardware kit, so once you install them you don't have to worry. "Awesome. They corrected my alignment issues easily, and they look super! The quality is also top notch. You can see and feel the difference in quality over the OEM arms just by holding them. I like these much better than the SPC/Light Racing arms as they don't have all the adjustments up top, so it’s less to loosen or have to deal with."